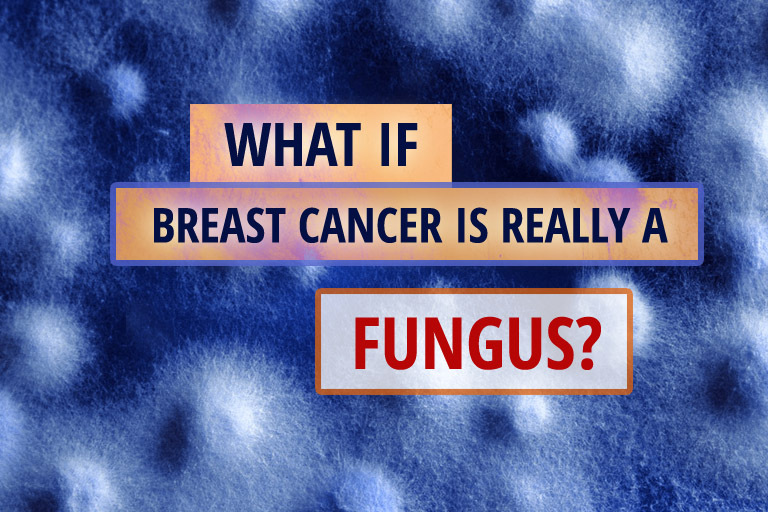 You are here: Home / Cancer Causes / What If Breast Cancer Is Really A Fungus? According to the National Cancer Center at the National Institute of Health, the word cancer is “a term used for diseases in which abnormal cells divide uncontrollably and are able to invade other tissues.” We all know the rest of the story… thousands of lives lost from breast cancer alone and billions of dollars wasted in the drive to “find a cure.” Despite all this, surgery, chemo, and radiation are still the only conventional options available. But what if conventional cancer research and the treatment plans that stem from them, have been asking the wrong questions? He first made this “out-of-the-box” connection after he noticed the milky-white appearance inside the cancer tumors in his patients. As any woman who has suffered through a yeast infection can confirm, this is similar to how surface-area outbreaks such as candida albicans often appear. Another link between fungi and cancer is their relationship with sugar. Healthy cells in our bodies use glucose and oxygen to produce ATP (adenosine triphosphate), which is the main source of energy for cell function. Cancer cells, on the other hand, use fermentation to produce ATP. Fermentation does not use oxygen and is, in general, a very inefficient way to produce energy. Cancer cells must consume large amounts of sugar in order to survive and grow. Cancer cells love sugar and so do fungi. What is the first thing you do when candida gets out of control? That’s right − lay off the sugar and simple carbs like bread and pasta. Sugar feeds cancer and it feeds fungal growth as well. Dr. Simoncini recommends the use of simple baking soda, or sodium bicarbonate therapy. Because the most effective way to shrink tumors is through direct contact with the sodium bicarbonate, in most cases a catheter is used to go through the arteries to the organs within the body. For some cancers, including breast cancer, a simple local infiltration or injection can be used instead. Dr. Simoncini himself claims that this method carries a 99% success rate for healing breast cancer without surgery. One can also enjoy an alkaline Baking Soda drink every day. In a glass of purified water, add the juice of ½ lemon and 1 teaspoon baking soda. Stir and enjoy. Because this is such an alkaline drink, always consume it 30 minutes before and at least two hours after a meal. Proper digestion requires an acidic pH in the stomach. In order to prevent breast cancer naturally, be aware of breast cancer signs, and follow a healthy anti-cancer regime that includes the “7 Essentials” of an anti-cancer diet, herbal supplementation, detoxing, emotional healing, biological dentistry, energy balancing and early detection. Maintaining the proper alkaline balance in your body is key to keeping fungal growth − and breast cancer − at bay. Just because you don’t believe it, does not mean it is not true! So Dr Leonard on what it is the basis for your “BS” appraisal of this theory? I mean in view of the fact that many known cancers are caused by known pathogens, bacterium, virus, various parasites etc. Have you researched any of Dr Simoncini’s work? His results seem quite impressive . Unfortunately impressive results in this field especially via such a simple mechanism are not looked on favorably by peers or the politics of industry. Maybe your preference in healing leans towards toxic heavy metals and radioactive isotopes? I hope that you don’t get cancer love? I only came to this site after researching mycotoxins for my son’s autism symptoms. The most potent natural carcinogens known turn out to be —— fungus. AflatoxinB1(in particular). Numerous reputable studies from good journals were sited. One that caught my attention was from the Journal of Clin Microbiol Rev 2003′ July 16. At any rate, mycotoxins from Zearalenone …can’t read my own notes..Fusarium…(? )Resemble17B-estradiol…..the principal hormone produced by the ovaries to allow it to bind with estrogen receptors in mammalian target cells…..I had an estrogen positive breast tumor so this caught my eye. Apparently there is no question that many mycotoxins are carcinogenic and have demonstrated their capacity to alter the DNA …. Especially the G To T mutation of the p53 gene. I never thought of cancer as a fungus ? Who knows. Fungus sure does play a role in ….a known role in…many cancers. If your oncologists has a better idea …uh..I figured that !!!! Dumb question.,does a persons P h balance play a roll in any of this? The only other thing I can say with reasonable certainty is that future generations will look back to 2016 and the current state of cancer treatment and shake there heads in bewilderment as to WHY anyone would undergo “treatment” that chopped and disfigured the human body, poisoned the whole body and made people bald and sick……and still didn’t “cure” most people. Modern medicine is screwed up. Modern medicine has problems curing anything because….up to now….the goal has been to manipulate symptoms. Case in point would be all the awful side effects from modern drugs. None of them are designed to get the human body back to a state of homeostasis ….just suppress symptoms. With cancer, they actually need to fix a body system, but there is no precedent . “Somebody” needs to start thinking outside the box…..anyway, soooooooo many great discoveries were initially scoffed at…..
Well said. My ENT/ Oncologist said as much within the boundaries allowed as to keep his job, knowing that as I talked alot to him about my research done , he knew I would understand he was confirming much to me. He also made it apparent all animal for is effectively similar. He is absolutely right about raising the PH level in your body. Just like a pool or a fish tank when the ph levels are off there is something wrong. Keeping the PH level at 8 will kill cancer. It can not survive . More people need to pay attention as to what they are putting in their body. Some people take better care of their cars then they do their bodies; God put all the fruit, plants, trees here for use to nuture and to heal not add all the toxic chemicals they are now putting in our food to make us sick. Leonard Viens sounds like an idiot. For years there have been many other cures for cancer, it’s just that funding to the hospitals will be cut if doctors even try treatments that are not chemo (toxic) or radiation. Both treatments CAUSE cancer…..I would try the baking soda and lemon water first….or the Ojibwa recipe of herbs that nurse Rene Caisse used in the early part of the 1900’s. She cured so many with the natural herb tea that the Ojibwa natives used. If cancer is caused by a fungus, why not treat it with anti-fungal medicines??? There are quite a few effective ones out there. Because there is too much money in chemo and radiation poisoning for doctors to make ethical and moral decisions for our health that do not include butchering and poisoning our bodies. also be well versed in nutrition and how to heal the body with food and herbs instead of big pharma since big pharma gives doctors big money, perks etc. haven’t you noticed you can no longer watch tv where 5-10 times per show you see an ad for a pharmaceutical? Some pharmaceutical products are so dumb like the one I heard last night for diabetes control then the lady said and it helped me eat better and move more too! Really!??!??!! Moving more and eating better will heal most diabetic conditions so you don’t even need a pill that has so many awful side effects and can even kill you!!!!! America is all about instant gratification. It’s time we took our health into our own hands!! You see clearly, also! Great comment. If it’s a fungus. Is it still good to take medicinal mushrooms? Aren’t mushrooms a fungus? I know this is going to sound crazy, but I was looking down at my fungus infected toenail and the odd way the fungal infected portion of my toenail grew looked like it was cancerous. It then occurred to me that perhaps cancer could be a type of fungal growth. So I googled could cancer be a fungus and it bought me to this page. I think that if cancer could be cured with some herbs and some baking soda, then the greedy, devils would just grab all of the herbs and baking soda, then sell it to hospitals for ga-billions of dollars. Dont wish it but thats exactly what will happen once there is enough research backing. You think im wrong but im not well heres a food issue. Have you ever heard of a egg bagel? Well guess what thats whats used in fast food places for their breakfast menu. Try finding it in a store and its nigh to impossible. Originally it was offered with basic,egg or onion. Ironically later fruit was added. Ive seen other instances as long as a lot of money can be make then yeah it wont be offered to the public.